Quiet operation, high performance cleaning and state of the art connectivity define LG Dishwashers. Similar to Samsung, LG dishwashers are not a match to luxury manufacturers from Germany. However, at a price point on or around $599 you will get a modern LG dishwasher that will be an essential helper in your kitchen. LG often bundles their dishwashers with rest of their kitchen appliances and top notch washer and dryers. This strategy saves customers a ton of money during promotional seasons. Although most of us know LG from their "Life's Good" advertising campaign it is important to note that company has a rich history since 1947. Innovation and technological expertise has enabled LG to lead the way as a global company with a production base in the USA and around the world. To reinforce their "creating value for customers" philosophy, LG offers a range of product choices grouped in three design styles. LG dishwashers feature different colors from popular Black Stainless Steel to regular Stainless Steel. Matte Black and White models are also available. Budget shoppers will be impressed with the value for money LG LDF5545. Those with a little more money in their pockets can get excited about our best-selling LDP6797, or the customer satisfaction guaranteed LDT7808 with all the standard LG features. For premium features and the best that money can buy, the Signature Series LUDP8997 is a dream for anyone who spends a lot of time in their kitchen. No matter what your budget is for purchasing a new dishwasher, you’ll be thrilled at the silent performance of all products, from the low-end models through to the best of the best. LG innovation has moved forward in leaps and bounds since the brand first started manufacturing dishwashers decades ago. Today you’ll find many excellent features specific to LG that make your dishwashing experience better than ever before. QuadWash - If you’ve ever worried that some dishes in your machine just aren’t getting washed properly, LG comes to the rescue with QuadWash. Four multi-motion spray arms, complete with spray jets, rotate back and forth during the wash cycle to ensure that every part of a dish is reached. The jets also use different pressures of spray intensity, so your cycle is faster and your dishes come out sparkly clean. This is an excellent feature to have, especially when you always have a fully-stacked washer. Dual Zone - Putting delicate items such as wine glasses into your dishwasher can often be nerve-wracking since there is a high chance that they could get moved around with the force of jets, ending up with pieces of broken glass. With LG’s Dual Zone function, you can allow your dishwasher to use different spray intensities for both the upper (soft) and lower (strong) racks. This means that you can leave all your heavily soiled pots and pans in the bottom rack and know that they will be taken care of, while your delicate glassware is gently cleaned above. Controlling your dishwasher is easier than ever before with LG’s superb technology that allows you to customize cleaning programs or manage your machine through an app on your smartphone. NFC-Tag on Technology – NFC stands for "Near Field Communication" and it is part of the magic behind tap-and-go services such as Apple Pay and Android Pay. LG dishwashers have NFC-Tag Technology, so you can download new cycles on your smartphone app and then tag them to your machine by holding your phone next to your dishwasher. We expect LG to pack more features into their dishwashers via this technology. SmartThinQ®- Mid-range and high-end dishwashers include LG’s SmartThinQ® technology, which enables you to control all your Wi-Fi enabled appliances through one app on your phone. SmartThinQ® can send you an alert on your phone when your dishwasher cycle has finished, which is brilliant for busy people who don’t have time to wait around and keep checking that it’s done. You can also combine this technology with voice control features of Google Assistant or Amazon Alexa, making life easier than ever before. SmartDiagnosis™ - When something goes wrong with an appliance, it can be difficult to troubleshoot the problem. With this technology, your dishwasher can diagnose its own issue and communicate with LG’s customer service team at any time of day in order to fix it. This is a brilliant feature that saves you time and hassle, all thanks to your smartphone app. Inverter Direct Drive - We are not sure why appliance manufacturers come up with cryptic names instead of plain English. Inverter Direct Drive motor is a good example of bad marketing that you can find as a sticker on every LG product along with nationwide advertising... Yet the term does not mean anything to most of us. What LG is trying to state is simply this: "Your LG dishwasher motor will last you a good 10 years and we guarantee it". EasyRackPlus - Struggling with restricting racks and space is no longer a problem thanks to LG’s EasyRackPlus. With three racks that can be arranged to suit the dishes you have for each wash, you can fit more in your load without the fear that parts of your dishes are not going to be cleaned. Lower rack: The lower rack features foldable tines which you can adjust depending on whether you have plates or larger pots and pans to wash.
Upper rack: The one-touch adjustable upper rack allows you to easily raise it with the touch of a finger to make room for dishes in the bottom rack. Third rack: The third rack is also height adjustable, so you can fit silverware, flatware, and even espresso cups neatly at the top. 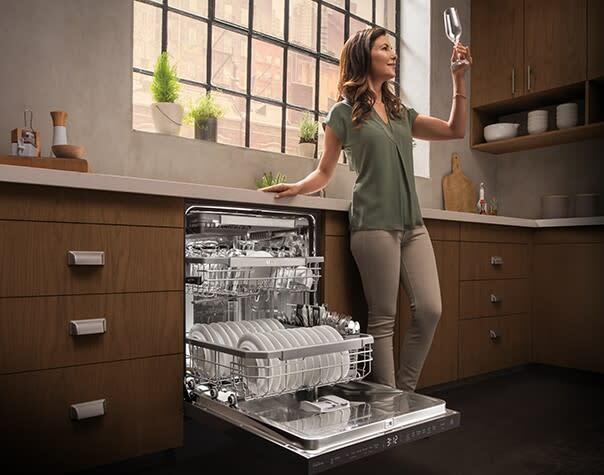 NeveRust™ Stainless Steel– LG’s NeveRust™ Stainless Steel tubs ensure your dishwasher lasts longer. SenseClean™ Wash System - By recognizing the soil amount on your dishes, this function can adjust the cleaning efficiency and energy usage. LoDecibel™ - With decibel ratings of between 40 to 48, dishwashers in all price ranges are extremely quiet. Hybrid Condensing Drying System - This function uses both heated dry and fan drying for super-dry dishes. Safety Float Switch (Leaks) - If for any reason your dishwasher starts leaking, this safety feature will stop the machine to prevent flooding. Rather than you having to scour through all the different LG models available to compare their features, we’ve put together our top picks of the range from budget to high-end to assist you with your purchasing decision. While society often leads us to believe that cheaper products are somewhat inferior to more expensive ones, the LDF5545BD is definitely a product that you can trust in the budget price range. Sitting at around $580 (depending on seasonal promotions), this standard 24-inch front control dishwasher features the QuadWash and EasyRackPlus functions, as well as Dual Control so you can separate your delicate dishes for piece of mind. This model may not be the quietest of the bunch, but at only 48 decibels, it’s certainly quieter than budget models from other brands and comes with full stainless steel interior. You’ll find an electronic touch control display on the front as well as a flush handle, and you can choose between stainless steel, white, black, or black stainless steel to match in with your other appliances. If you are on a low budget, the LDF5545 is an ideal model in terms of the features and performance that you get for the price. Moving up to the mid-range dishwashers, a better choice if you have a little bit more money to spend is the LDT7808BM. Coming in a choice of stainless steel, black stainless, or matte black stainless, this sleekly designed 24-inch model with no visible controls is a delight to have in any kitchen. As you’d expect of a price point around $985 depending on seasonal promotions, the Energy Star LDT7808BM comes with a few more extra features such as TrueSteam, SmartThinQ® Technology and Wi-Fi, and is also super silent due to its 42-decibel rating. If you are looking for a trendy dishwasher for your modern kitchen, this is definitely a great option. An award-winning appliance already speaks for itself, and the LG Signature Series LUDP8997SN is no exception. With only 40 decibels of sound, this model was the winner of the CES 2017 award for ultra-quietness and is the best-rated LG dishwasher on our website, with all the bells and whistles that you will ever need. Along with all of LG’s standard features, you’ll find 9 wash cycles, SmartThinQ® and Wi-Fi connectivity, so you can use Google Assistant to control the dishwasher with your voice, a truly outstanding feature for busy parents that have a lot on their plate. Even though this model is priced at around $1525, you’re getting every bang for your buck and is a product that will exceed your expectations. While you’ll only find this in stainless steel finish, it still looks great in any kitchen along with your other LG appliances and will serve your household’s needs efficiently for a long time to come. Is an LG Dishwasher Right for Your Kitchen? LG dishwashers are constantly featured on "Best Dishwasher" lists around the world and it’s easy to see why. With modern features and outstanding smart technology, these super silent machines are a perfect addition to any kitchen. Not only can you find a model that complements the rest of your LG appliances, but you can also find a feature packed dishwasher at a decent price point. If you need some help deciding on which is the right LG dishwasher for your budget and needs, feel free to contact us here at Designer Appliances and we’ll be glad to assist you. Or, if you are in the area, drop into our showroom and take a look for yourself at the excellent LG selection.